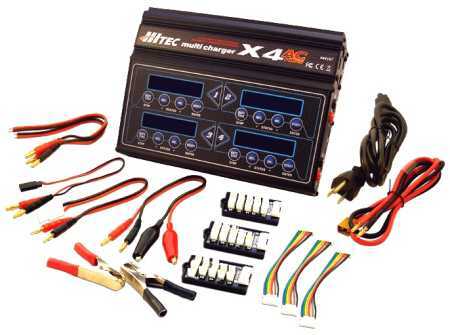 The Hitec X4 AC Plus is a compact 4-Port Multi-Chemistry Charger equipped with a built-in 200 Watt AC power supply. Simple to use and utterly reliable, this charger features four identical and independent 50-watt power outputs with advanced battery management software and an integral balancer on each one. 6-12 volt lead acid batteries. The four individual balancing ports eliminate the need for a separate balancer when charging Lithium batteries. Its twin fan cooling system with an internal sensor for controlling fan speed provides the utmost in efficiency and safety. The X4 AC Plus can accept a variety of power inputs including the option of attaching it to a 12-volt car battery or a 11–15 volt (20 amp minimum) DC power supply.